In 2017, Beaumaris Singers appointed Peter Smith as our permanent Director of Music. Peter was born in Nottingham, and moved to Shropshire at a very young age. He started singing in various church choirs run by his father, before becoming head chorister at St Andrews Church Shifnal, under the direction of Peter Richards. Further singing experience was gained as a counter-tenor at St Peters Church Wolverhampton, working with Andrew Newberry. Peter was to return to Shifnal briefly as assistant choirmaster before moving to St Mary Magdalene Albrighton as Choirmaster. On returning from Wales, Peter took an appointment as Director of Music at All Saints Parish Church, Royal Leamington Spa, helping to maintain the “Cathedral” choral tradition . For the last twelve years, Peter has been director of St Marys Ecumenical Choir, which is based in Shropshire, but attracts singers from all over the country and further afield. The choir deputises in Cathedrals during holiday periods. He is also Director of Music at Shrewsbury Abbey. 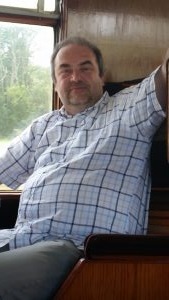 Peter’s other interests include travel, cooking, and steam railways. An enjoyment of Real Ale is usually fulfilled after choir practice.